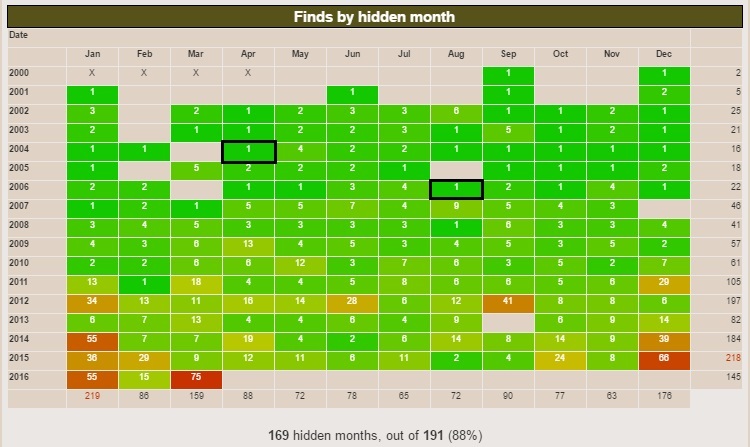 I don't know who Jasmer is or was, but there's a side game in geocaching named after him/her/it. The idea is to find at least one cache that was hidden in each month since geocaching started in May, 2000. With less than 150 surviving caches from the year 2000 in the world, it does take some planning! We headed out the door with a couple specific caches in mind. The first was located on the grounds of the former Rittenhouse Airfield. Rittenhouse was used as an outlying field for Williams AFB. In spite of the years I spent researching Willie history, I'd never been to the Rittenhouse field. 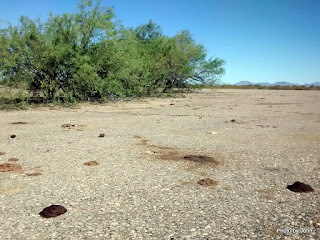 Now the grounds are used for cattle grazing and hosting a solitary cache that filled my Aug, 2006 grid hole. With one found, we headed out to San Tan Mountain Regional Park to find the final of the American Muscle mystery cache that was placed in April, 2004. 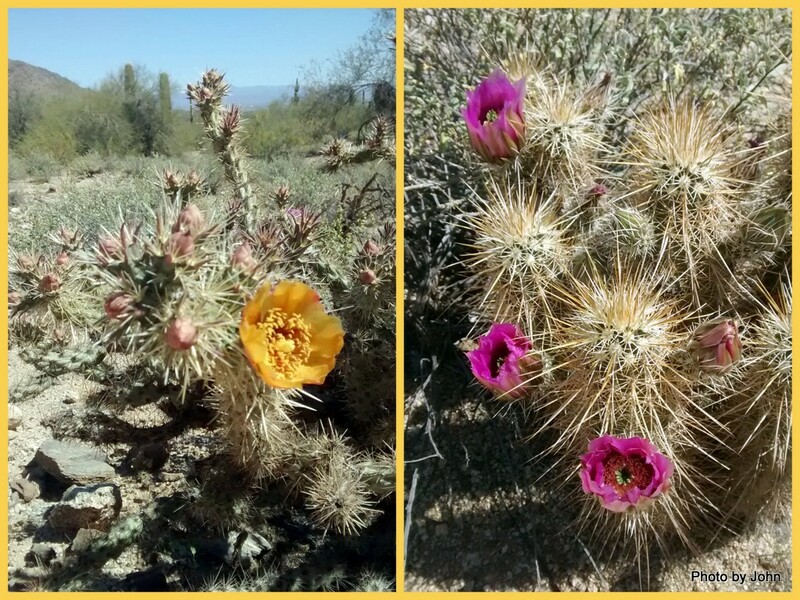 While located in Pinal County, the San Tan Mountain Regional Park is one of the Maricopa County Parks. Don't ask... Entrance is $6 per car. The trails are amazingly wide, generally smooth, and very well signed. The park has miles of multi-use trails. We were there in the middle of the week and saw a few horses and a few bikes and a few hikers, but often had no one else in sight. Nice! While our primary target didn't require it, we hiked a loop of nearly 6 miles and in addition to our target, picked up three other easy caches. 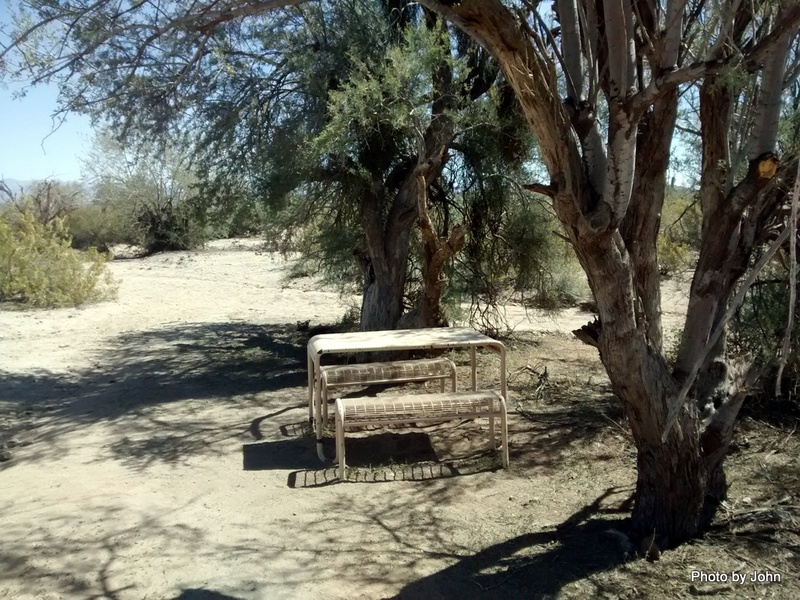 There were benches and an occasional table in shady spots, encouraging one to sit awhile. 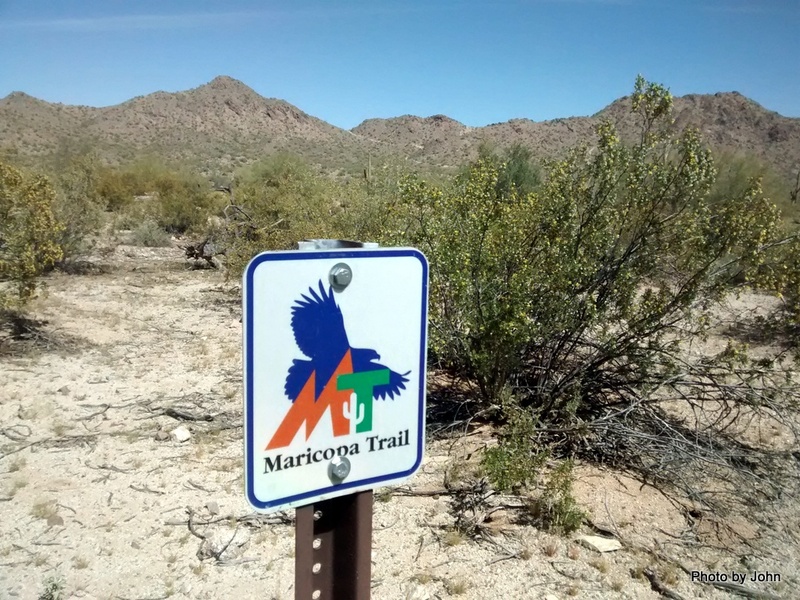 I've only lived in Maricopa County for over 25 years and hadn't ever heard of the Maricopa Trail. 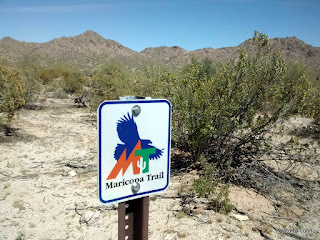 Turns out the Maricopa Trail is about 240 miles long, connecting all of the regional parks together. 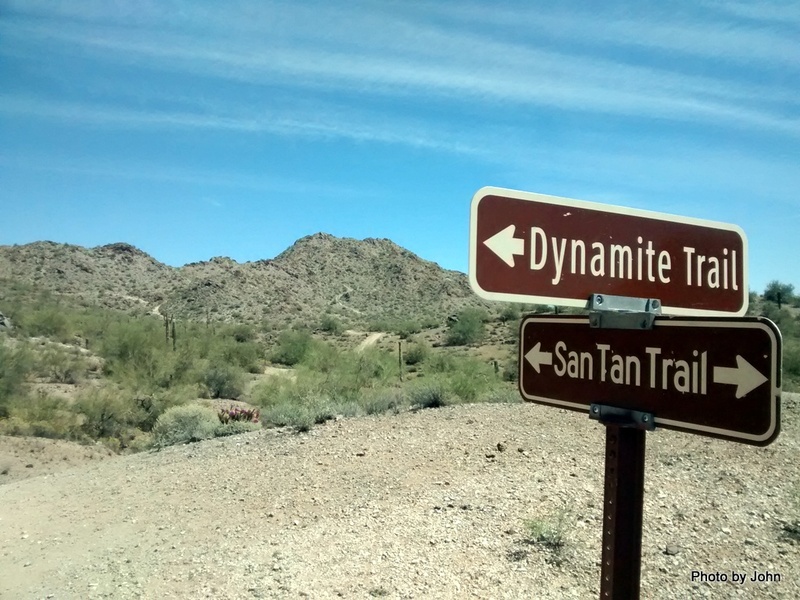 Not sure I can envision hiking from San Tan to White Tanks, but I guess it's possible. Nearly everything was blooming, even the pokey stuff. Once again, geocaching took me to a place I'd never visited. Now I understand why the Town of Queen Creek folks talk so much about "their" San Tan Mountain Park. The only thing it was missing was a place to camp, unless you want to be a Park Host Volunteer. The real reason I was at Lee's Ferry was to see a couple great river-rat friends off on their trips through the Grand Canyon. Izzy (from my GC trip a couple years ago) was River Lead for a group of folks, primarily from the Las Vegas area. They leveraged Moenkopi Riverworks to provide rafts, shuttle, kitchen equipment, and food organization. The Moenkopi truck and trailer showed up with a couple guys who immediately got started unrolling and inflating the 18' rafts that would be their homes for the next 25 days or so. who immediately formed a bucket brigade to unload the rest of the gear, finish the boat rigging, and get the gear loaded. It was an interesting experience to watch the process. As the Moenkopi staff would pull an ammo box off the truck, they'd tell the folks which boat and which location on the boat. Their planning was complete to the level of mapping of each boat for the food, emergency gear, groover boxes, etc. Pretty impressive! There were milk crates of veggies that went into some of the hatches. Once all of the boat gear and outfitter provided food and equipment was loaded, the stowing of personal gear could commence. I left out the picture of the mountain of canned beverages that were considered essential to the trip. The next morning (it's almost always a two day process at Lee's Ferry,) the boats are tied off at the beach just below the launch ramp, and the last of the overnight camping gear is arriving to be loaded and secured. At 9 a.m., the ranger starts the briefing process by checking each individual's photo I.D. against the list of passengers. During the winter season, there are usually two private trips launching each day. Private trips are limited to no more than 16 individuals. Once every person is accounted for, the ranger begins the briefing. Even though some of the participants have done the trip multiple times, the briefing is considered mandatory. After the briefing by the ranger, and then a briefing by the trip's River Lead, the last gear is tied down, PFDs are zipped, and the trip heads through Paria Riffle to begin their trip through the Grand Canyon. The day after Izzy's trip launched, five historic replica dories and a modern, decked version of a McKenzie River dory arrived to prep for their trip. This trip was limited to wooden dories. I was especially interested in the historic replica double-decker boat trailer hauling the Flavell and Susie R.
Helen, and her version of Susie Too was going on this trip, along with Tony to share rowing duties. Most of the boats were floated off their trailers. I was wondering how the Flavell was going to launch but it quickly became apparent! Dories are the sports cars of river craft, but generally don't have space for the monster coolers that form the core of meal planning for raft trips. There was a whole lot of dehydrated food prep going on at Helen's shop before this trip! Rob's McKenzie River dory had beautiful lines and a very logical deck design, while the historic boats sported historic colors. The Emma Dean is also a replica of the original Susie Too - for this trip sporting the second name the original boat wore. The third name of the original is Music Temple. The original boat is in the collection of the Grand Canyon National Park. The following morning found Tony stowing the rest of his camp gear in the rear hatch of the Susie Too with his trademark grin on his face. This trip got off to a stressful start. Craig's Flavell II had somehow become untied the night before and drifted away. It was spotted up against some rocks just above Badger rapid - the first rapid of significance in the canyon. Craig and Dave got permission to leave with the Susie R before the briefing to try to get to it before the river rose as it does everyday when they demand more power from Glen Canyon dam. Reports are the boat did not receive any significant structural damage. It's going to be interesting to hear the rest of the story when they all come off the river! 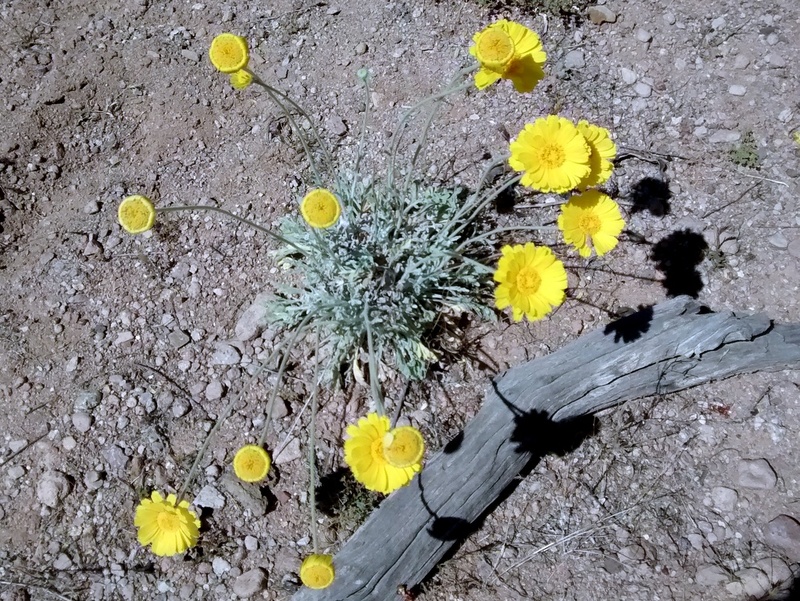 Lee's Ferry (don't ask me why the NPS and others drop the apostrophe) has a long, colorful history closely related to Mormon settlement in Arizona. 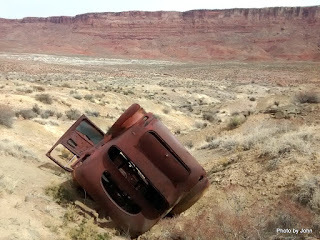 In addition, it's situated in some incredibly beautiful red rock country. These days, it's known for trout fishing below Glen Canyon dam, flat-water motor raft tours from the dam to Lee's Ferry, raft rigging for white-water trips through the Grand Canyon, California Condors near the bridge, and historical artifacts. When I was here 18 months ago, it was only for a couple days. This time I had more time to wander around. Every time I'm here, I notice new things. This time it was the commemorative plaque about John Lee's settlement, placed in front of the building that was the American Placer Mining headquarters which had nothing to do with Lee but was photogenic. They've closed a short section of road, apparently because the Paria River has been cutting away at the edge of the road. The end result is that you have to walk a bit further to get to Lonely Dell and some of the buildings that Lee did build. There are cabins from the first two families that settled the place as well as the larger house that was the last house used when Lonely Dell was ranched after the construction of the bridge and decommission of the ferry. Of course, while I was at Lonely Dell I had to get a picture to log the associated virtual cache. The hoodoos near Cliff Dweller's Lodge always draw me back. They just seem so unreal. I appreciate the imagination of the people that decided to leverage some of the hoodoo as head starts on dwellings. The roof is gone off the biggest one, but one of the chimneys is still standing. Like Lonely Dell, this one is featured in another virtual cache, so I found the spot (not here) and got the requisite picture. Usually, I'm so enamored with the primary structure that I don't look any further. This is the first time I've visited here and realized there are remains of several other hoodoo homes. I've love to find more information about who built them. Geocaching brought me to this find. The car is not visible from the road, but it is the namesake for the Dead Body cache that is located nearby. I love the cliffs in this area. No wonder John Wesley Powell was impressed. The Grand Canyon National Park is visited by about 5 million people each year. Only a small percentage spend any time on the North Rim, and of those, very few even slow down as they drive through the Lee's Ferry / Marble Canyon / Vermilion Cliffs area. I guess that is their loss. I have two friends that were launching on Colorado River trips through the Grand Canyon within a couple days of one another. That was all the excuse I needed to hook up the trailer and head for Lees Ferry. I was going to stop at the Navajo Bridge on my way, but the parking and interpretive center on the west bank was closed so I dropped the trailer at the campground and came back to the "market" on the east bank. I did some rock climbing in high school and heights have never seriously bothered me. In fact, I enjoyed the view from the bridge down to the river over 460 feet below. and other mechanical equipment and buildings remain as a reminder of his big dreams. They discovered a seam of coal about 30 miles up river that they intended to use to power the boilers. The investors wanted to use the paddle wheeler to move barges of coal but it was under-powered and couldn't make it upriver. Instead, in 1910, they constructed a trail up the cliffs so that they could use mules to haul coal overland from the coal mine site. I've stood at the bottom several times trying to pick out the route of the trail. This time, I wanted to hike the trail as a way to access a cache about a mile northwest on the rim of the canyon. Instead of using 4WD, I was planning a 6 mile R/T hike to get there. The trail started out quite nice. The National Park Service states, "It is not regularly maintained by the National Park Service but is passable to careful hikers." There are quite a few stone steps in the lower portion of the trail and I was pleased with what I was seeing. With a bit of elevation, the views downstream to the boat launch (center of the frame) and the Vermilion Cliffs were pretty impressive. As I continued up, the trail got more exposed. If you click on the picture you'll get a larger version (as always) that will help you pick out the trail across the talus slope. I eyeballed that one and decided to keep going but put the camera away. A bit further, the trail got VERY narrow with 500' of vertical drop. It was at that point that I decided I didn't really need to visit Lonley Dell Overlook [sp]. Turns out, heights do bother me when the trail gets so narrow that you can't even use one trekking pole! It was fun while it lasted! With lots more time than I expected on my hands, I drove around to Page to visit the Horseshoe Bend overlook. I've done this section of the river as an overnight kayak trip, but I'd never stopped at the overlook before. Turns out the height there didn't bother me - I think because there was always space to step away from the edge. In any case, the day was lots of fun. BJ spent nearly 15 years volunteering with Search & Rescue organizations in the Superstitions. 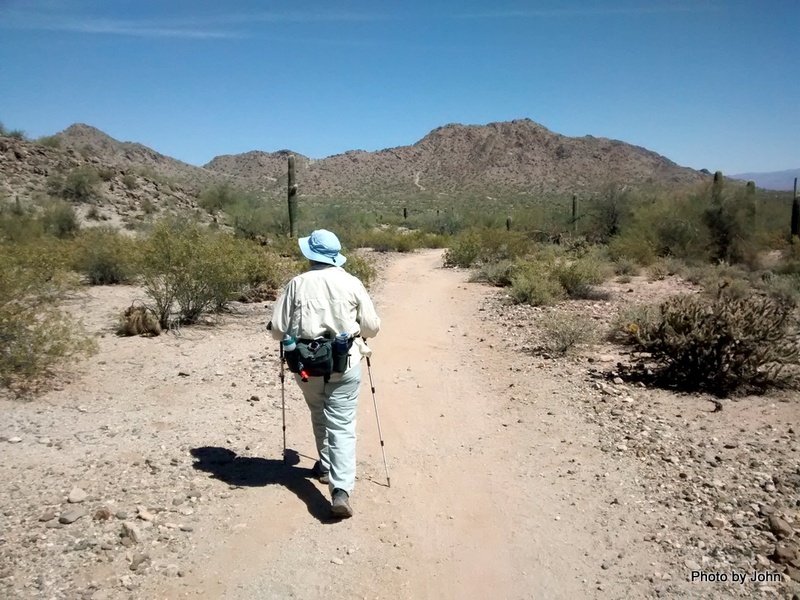 It seemed like nearly half of her call-outs were to the Peralta trail. While she was busy hiking the Sups, I almost always had an excuse. Now, with a goal in mind, I wanted to hike to Fremont Saddle for a couple old virtual caches. We'd waited for this day because of the forecast cooler temperatures and because her knee had a few days to recuperate since our last hike. We arrived at the trailhead before 9 a.m. and signed the hiker's register. The first goal was the Peralta Trail Balance Rock virtual cache. Originally, it was a traditional cache but since it is located in the wilderness area, the physical cache had to be removed. Now it was simply a matter of getting to the right place and taking a picture to prove you got there. I've got a thing about saguaro cactus, and took lots of pictures that I'll not force upon you. By the time we were 3/4 mile up the trail, we could see the rock that was our first destination. Of course, this wasn't the angle needed for the log entry! As we got closer, we decided that while the top rock was nicely balanced, it could easily be the huge one on this side of it that might be the first to go. After we got the photos we needed here, we continued on up the trail. Although it was a Monday, the trail was busier than I expected, including a few young people who were obviously out on multi-day trips. Turns out it was ASU Spring Break and some of the students stayed closer to home. This gal was two days into a loop trip and was already one day ahead of schedule. We saw quite a few babies and a few very young children, sometimes walking, sometimes riding along. As we got closer to Fremont Saddle, we still have a view, albeit different, of the balanced rock, now well down-valley. Top of the pass brought the famous Weaver's Needle into view and we had our second goal for the day. The Fremont Saddle cache has been in place since early 2001 and ticked a couple boxes for me. Going back down wasn't much faster, but it didn't require as much deep breathing! The trail was just as rough going down as going up. I was amazed at the number of people doing this 4 mile R/T, 1,500' elevation gain hike with just a single 16 oz water bottle in their hand. No wonder Search & Rescue was busy!